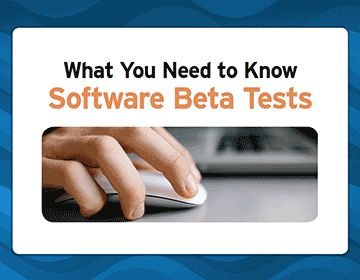 Different types of products require different beta testing strategies. From hardware to software to mobile apps to video games, each product will need a unique plan of action in order to run a good beta test. Our What You Need to Know series goes through the unique challenges for each type of beta test and gives you actionable advice to make your test a success. Our last installment of this series walked you through running a successful hardware beta test. The chapter we’re releasing today provides all the information you need to run a smooth software beta test. Software beta tests are an entirely different animal from hardware tests because they don’t involve physical beta units. This gives you a lot more freedom in your test, but also affects your goals and beta management strategy. This chapter looks at how you can handle larger tester teams, protect your software, and incentivize your testers, all to ensure that you’re getting the valuable feedback you need to improve your product before launch. At the end of the chapter, you’ll find a handy checklist that will help you through your test without forgetting any steps along the way. If you’re just getting started with this series, be sure to check out our first chapter, What You Need to Know About Beta Management, for a complete overview of beta testing best practices. Download the Software Beta Tests chapter now!